As we are winding down with our school year I've been trying to do more reading aloud to the little ones. My six year old has never truly taken to being read to so it is a work in progress for us and some days he will sit for an hour and some days it is hard to get him to sit for 10 minutes. I was recently sent this book from the Berenstain Bears Living Lights A Faith Story collection. 5 - Minute Inspirational Stories (by Stan and Jan Berenstain with Mike Berenstain.) This has been perfect for those days where Jace's little body just doesn't want to sit still for a long time. One of the things I love about the Living Lights: A Faith Story books is that they all have themes that include the Christian faith and God. Those types of stories are so dear to me because they help reinforce the life lessons we are teaching at home and learning in church. Seeing sweet characters like Brother and Sister Bear struggle with a life lesson and turn it to a positive teaching moment adds a wonderful experience for my children. Sometimes seeing someone else (or in this case reading about) have a struggle or experience can really help mold our reaction. This book includes 12 stories that will hopefully inspire your children as much as they have mine. 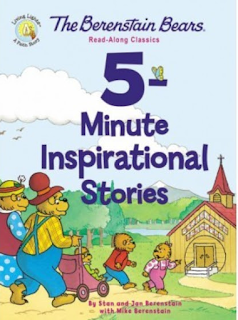 Look for The Berenstain Bears 5 - Minute Inspirational Stories at your local book retailer or at online stores like Zondervan.com.